In Like a Lion needless to say will refer to what we will be experiencing over the next day or so with the beginning of March. 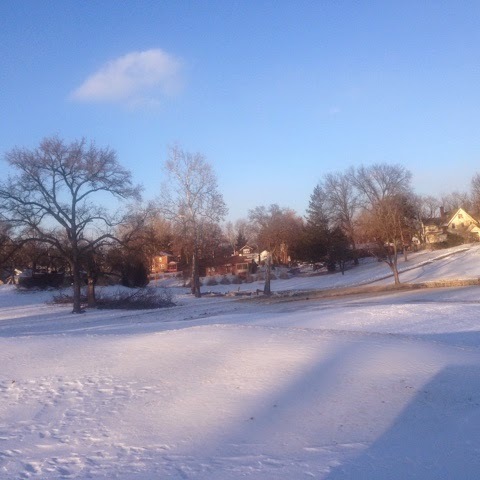 Cold temperatures this past week have still kept a fairly decent amount of snow on the course and the inches we will receive by Sunday night will impact us even further. We will be getting a nice day on Tuesday which will help melt some of this stuff away but the rest of the week does not look good until next weekend. I'm giving fair warning to you now. I expect that once the snow has left the greens, the course will remain closed until the freeze has come out of them so we are not creating excessive imprinting and root shearing near the surface of our greens during this important time of our greens transitioning from winter to spring. I will continue to keep you updated during the week with blog posts and twitter messages that can be followed directly on twitter or on the twitter feed at the top right corner of the blog. The siege of the Alamo began 3 days before we arrived 179 years ago. Well, I thought my trip to San Antonio for the annual conference would be both great professionally and personally. Nice weather would allow some enjoyment outside during breaks and great evening walks on the Riverwalk going from social functions and back to the hotel. Still warmer than Stl but only one really beautiful day we got to experience. Professionally the show was excellent. Excellant presentations I saw over a couple of days from my peers as well as researchers from all over the country. Poa annua, plant defense activators which assist plants in combating diseases, water management and managing course for environmental/business sustainability were just a few of the topics. I'm in print on the trade show floor. One 100# of bentgrass seed in a contest in Nov/Dec. Lets hope I'm not forced to use it but only use it in the fall to encourage higher bentgrass populations. Nice presentation from San Antonia Water System regarding water conservation. Trade show has lost some of its size from the glory days but large enough with a lot of ideas on equipment and supplies that we might consider using over the next few years. We made a significant equipment purchase 2 years before I arrived and a majority of that equipment is heading into 9 years of age. Some have aged slowly with lower hours and still has some good life but a few pieces are getting near retirement in their career at Glen Echo. We will be making purchases over the next few years to spread the impact of our aging fleet on the finances here at Glen Echo. Staggering purchases keeps everything from aging all at once creating a significant impact on the club's finances. It is not beyond the possibility of purchasing some used equipment with lower hours that will help to reduce the impact to our bottomline. Some of our equipment can cost mid-20's to over $50k for our rough mowers and fairway units. Just as automobiles, equipment does depreciate in time and some of the initial impact from being new can be offset by pieces purchased from leases after 3-4 years. Still plenty of life available for us to utilize. Part of that equipment we will need to replace includes member golf carts which we need to begin rotating newer carts into the fleet over the next few years. We;ve made a substantial battery replacement over the last couple of years and need to put a few years on these batteries to get our value out of the purchase but don't want for them to become too aged where we have to start replacing them for the 2nd time. Carts the size of our fleet can cost upwards of $250k or more. Well, I better close for now. My weekend and time to go check the parking lot and drive. A party this evening in the clubhouse and need to make sure the roadways are safe! Snow still covers the course and with the cold temps over the next couple of days, I would expect the surface to turn hard as a rock. I'm guessing that the course will remain closed this week. I would expect once the snow leaves and the greens begin to thaw that we will be closed until the greens have thawed allowing the moisture to move away from the surface. I will keep you updated as the melting and thawing begins. I will be spending a few days in San Antonio this week at our National Superintendent Conference. Education, equipment/supply show, and networking with some of the brightest minds in my field will be at the forefront of my week. 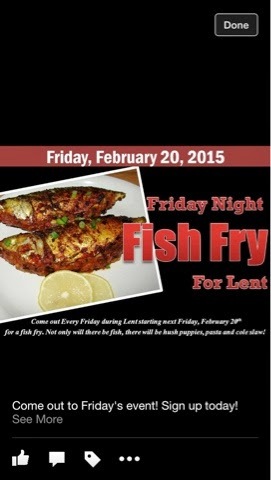 This Friday night marks the start of Glen Echo's always-popular fish fries during Lent. For the next seven Fridays until Easter the club will offer hand-breaded cod fried or baked along with hush puppies, pasta and cole slaw. The price of the fish fry is $15 and includes unlimited refills.Of course in addition to the Friday night fish fry the club will serve up several other tasty treats each evening. This weekend's menu also includes an herb-crusted veal chop, pan-roasted duck breast, stuffed tilapia, Greek burger, soups, salads and other items. For reservations you can go to the website or call the club . As a reminder, the club is currently open for lunch and dinner Friday, Saturday and Sunday through the end of March, with a Wednesday night happy hour offered at the bar next month. We'll see you at the club. The Veranda(upstairs patio) has been pretty much void of color/greenery over the years. From time to time we would place some pots up there but the space is very large in scale and the pots were too small to fill the space. We've been in a carpentry mode so I contacted Becky a month or two ago about the potential of us building some planters that could make an impact in this area. We evaluated it and thought it could provide great improvement to this under utilized area of the club. The boxes will sit on the large brick/concrete railing around the outside of the veranda. The planters will begin on the right as you walk out onto the patio. The first will be 60" long. A second at the corner will be approximately 60" in total length, Three 69" boxes staggered above the willow room and Board Room and a 140" long spectacular double planter will be above what was the Family Room. The boxes will be 13" tall and 17" wide. Substantial enough to grow nice sized plants and deep enough to prevent the soil from drying out too quickly during the heat of the summer. We intend to place a automatic water system on each planter to assist Becky in managing these large planters. The Veranda is a large space that is underutilized at the club. We believe the boxes and the color of the plant material will not only enhance this area but will also give the clubhouse a great look from the course and or the Marvin Pearson Lane as members and guests drive toward the clubhouse. Becky plants our urns and other pots on a 3 season schedule. I think for this season, we will probably plant these for the summer season and will evaluate for additional seasonal plants after we've had a chance to determine what will work best. Finished planter before staining. They are 3" taller sitting on the table then what they will be on the railing. We offset them 3" so the sides will overlap the rail providing some safety for the box as it sits on the wall of the patio. Tom staining the box. We used treated cedar to reduce the wood decaying prematurely. No this is not a coffin, its the inside view of the planter. 60" long. We lined to planter to protect from decay and also placed 3 drain holes in the bottom with hose attached to catch the water and drain it away from the brick/concrete so it does not stain it. This planter will be above the ground patio. We have 3-69" planters for the club lawn side as well as one two section planter which will be 70" a piece for a total of 140". They should be spectacular. Skip and Jason working on the corner planter that will go above the ground patio. As many of you know, I like to keep you informed of interesting things taking place at other courses. Eloise and Elliot, are the 2 Harrison Bay Tennessee Bald Eagles that we have followed for the last 5 years. Eloise has just laid her 1st egg. 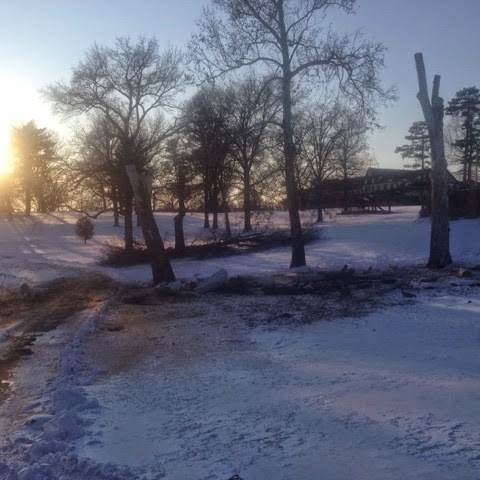 Our contractor is out today topping 3 large trees along #9 club lawn that are severely compromised and have been on our removal list. 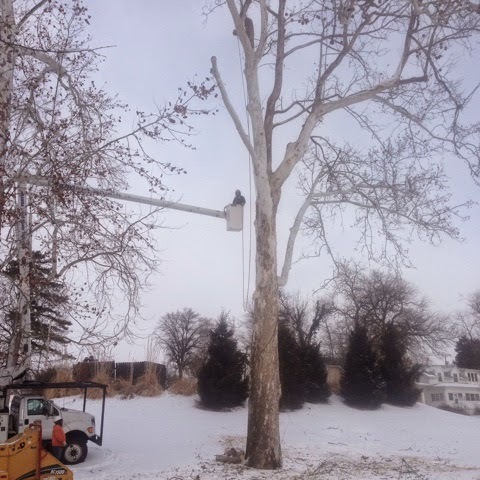 The contractor is removing the larger limbs which will make it safer for our staff to then drop the tree. 2 have large wounds/hollows and the 3rd has a large dead leader. Removing this leader places the tree in serious balance issues. It is listing toward the lake with all of its weight which creates a hazardous condition for everyone. It is also in the way of a drainage project MSD will be performing in the future. 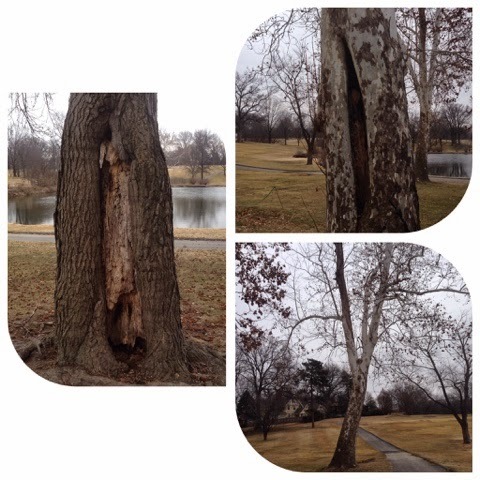 L-R Sweetgum hollow, Sycamore hollow and Sycamore with damage leader and in the way of future construction. Sycamore near the trash dumpsters. 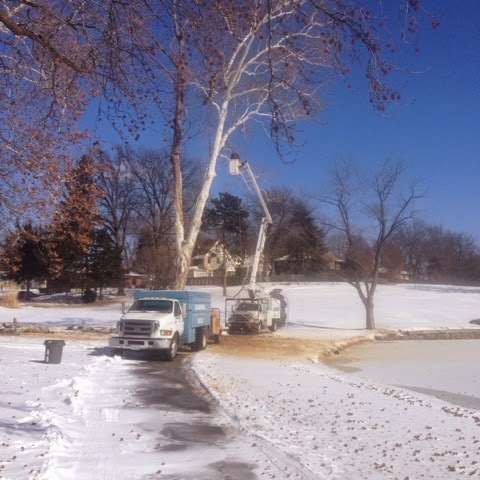 The tall Sycamore near the lake being removed. End of a long, cold day for our contractor. We will be dropping the 3 tree trunks and clean up the remnants over the next few days..
Last month, the matriarch of Beth's family her mother passed after a very long lived life. Yesterday, I was given the opportunity to celebrate the matriarch of our family, my mother's 75th birthday. My mother has been a guiding force in my life. A strong leader who has taught me to share our talents with others not as fortunate, give of oneself before taking, be humble when good things happen and continue to grow as a human being no matter one's age. As I was finishing my high school years, my relationship with my parents was good, respectful but as some of us experience, it became strained because of my need for independence and self expression, aka, I could not keep my mouth shut! (and board members say ah that's what it is) Mom told me many years later that she was never so glad to see one of her children go away to college. Embarrassing to hear that as a grown person but true no doubt. As a family, we were not a huggy type but after the 1st year in college, I began to hug mom and give her a kiss as well giving dad some love as well. Luckily that started because a few years later we lost dad to a sudden death which shocked all of us to our core. This past year, my experiences with Beth and the losses she has faced has made my hello hugs and goodbyes with my mother last a little longer. Not just for the fear of what might take place before my next visit but to thank her for what she has done for me over my lifetime. We were talking about a college opporutunity for a grandson yesterday and were reminiscing about her life and well it had been lived. She spoke of the day she had to make the choice to move from her beloved step-grandmother's home to move to her dads so she could go to free high school. At the time where she lived, she was outside the high school district and her grandmother could not afford to send her to high school because she was too poor, this was mid 50's in southeast Missouri. She talked about how it broke her heart to leave her grandmother but it was the right choice because it set her life in motion. She met my father, I was concieved and as were the rest of our family and the rest is her history. I honor you mother for your determination, your courage, and a life lived for others. May you have many more years with us! The clay courts will remain in place but the staff is in the process of removing the asphalt tennis court fencing, poles, and asphalt/gravel layer over the next few days. The asphalt court has been in disrepair and there are no plan to renovate the courts at this time. We understand tennis is important to a number of our members and we will still provide 2 very nice clay court surfaces for learning and enjoying this sport. We intend to use the asphalt as a fill layer at the top end of the range. We will then take the sand spoils from the bunker project that were placed in piles and will use it to cap the asphalt. It will have a more finished appearance and will assist the range staff in locating balls hit into this area and will allow us to mow it as necessary. There is a high concentration of bermuda that was already covering the old mounds and will grow again. We intend to get some fill dirt to cover the old court area and will then seed/straw it to cover the scar from the old courts. I don't necessarily want to fill the area with trees but we will be evaluating in case a tree would be needed. Staff pulling fence posts from asphalt courts. The area on the back of the range where we will place the old asphalt. Sand and dirty material that will be placed over the asphalt. A nice story on maple syrup festival this weekend in far west county if you have an interest. We don't have enough trees or production at our site for this type of program but it looks like a fun event for famlies. Weather states for January. Daylight temperatures were a little above normal. The average temperatures were 6 degrees warmer than last year. Overall rainfall and snow is below normal for the month. Let's hope this trend changes over the next month or two. We need moisture in the winter to recharge the soil for the growing season. Rainfall 1.21" 2.4" -1.19" 1.67"
Snow .30" 5.6" -5.3" 15.8"
It was the 9th least snowiest January on record.